National legislation requires America’s homeland security agencies to disrupt transnational human smuggling organizations capable of transporting terrorist travelers to all U.S. borders. Federal agencies have responded with programs targeting extreme-distance human smuggling networks that transport higher-risk immigrants known as special interest aliens (SIAs) from some 35 “countries of interest” in the Middle East, North Africa, and Asia where terrorist organizations operate. Yet ineffectiveness and episodic targeting are indicated, in part by continued migration from those countries to the U.S. southwestern border since 9/11. Should an attack linked to SIA smuggling networks occur, homeland security leaders likely will be required to improve counter-SIA interdiction, or do so preemptively. 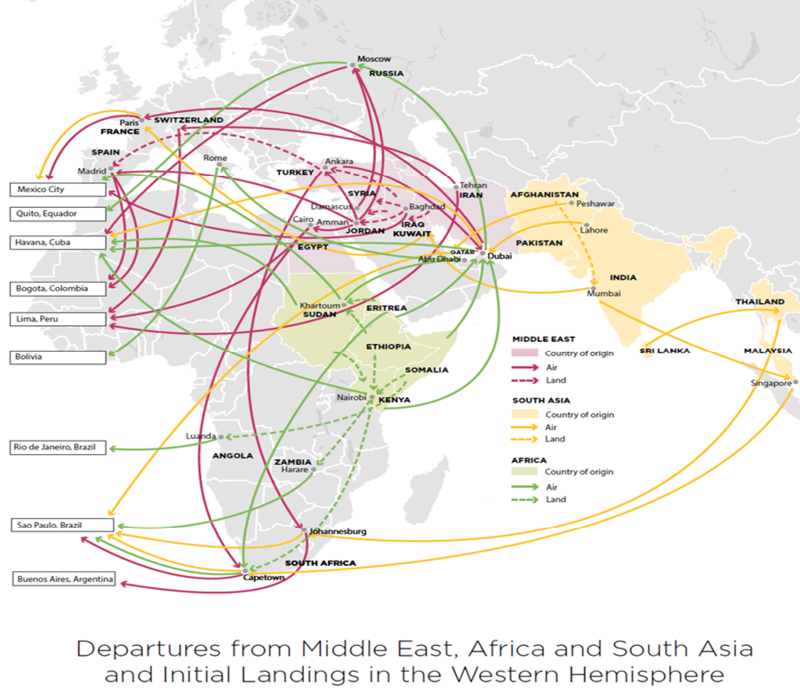 With a better understanding of how SIA smuggling networks persist in foreign geopolitical eco-systems, despite U.S. disruption efforts to date, could their most vulnerable fail points be identified for better intervention targeting? This essay presents the key findings of a systematic analysis of U.S. court records about SIA smuggling, as derived from 19 known prosecutions and a variety of other data between 2001 and 2015. It will discuss suggested leverage points and conclude with a list of strategy options for a more effective disruption campaign against them. In the year 2000, President George W. Bush took office promising to accommodate the American economy’s labor demands with a temporary worker visa program that also would have legally normalized millions of Mexican workers and reduced their need to cross the U.S. border clandestinely. The president’s plan was such a priority that his first foreign trip, in February 2001, took him to Mexico to discuss reform with his enthusiastic counterpart, President Vicente Fox.1 Momentum toward a bilateral accord had advanced to such a degree by September 5, 2001, that President Fox and his wife came to the White House for the American president’s first state dinner. This historical anecdote may stand at some variance with prevailing perceptions that contemporary U.S. immigration and border security policy evolved primarily around Mexican nationals and other Spanish-speaking migrants. But a preponderance of leadership policy statements, presidential papers, government commission reports, and the very language of post-9/11 legislation more persuasively suggest the motive was preventing Islamic terrorist border infiltration. Although the 19 hijackers of the 9/11 attacks had entered the country by visa and identity fraud—not through land borders—the concern driving border policy was that similarly probing follow-on attackers would breach the land borders next; the deleterious consequences on Mexican migrants were unintended collateral damage. No known plot has ever publicly surfaced. But, enter the example of the November 13, 2015 Paris attacks. These and subsequent ones in Brussels were carried out in part by citizens of France and Belgium who had been away fighting with the Islamic State terrorist organization in Syria and Iraq, but who had clandestinely slipped back for the attacks among thousands of illegal immigrants assisted by human smuggling networks.4 With these migrating foreign fighters came proof of concept for what had long been a mere border infiltration threat theory both in Europe and in the United States. Both SIAs and the smugglers who ran the sophisticated, globe spanning networks that move them over oceans and across urban and wilderness landscapes of vast continents became much hunted in the years after 9/11. SIA smuggling networks qualify as “dark networks” described by counterinsurgency scholar Sean Everton.5 These are clandestine enterprises that profitably move outlawed contraband and unwanted people as part of a vast underground economy. Invisibility is their greatest competitive advantage. In this kind of business, handshake bargains are struck for journeys, false documents and ill-gotten visas in Middle Eastern casabas, Kenyan refugee camps, and outside foreign embassy gates. The journeying occurs, seen while unseen, in the airport terminals of South Africa, the unpoliced jungles of Colombia and Panama, in speedboats off the Pacific coast of Guatemala, at the ungoverned borderlands of developing African nations, and in the bus depots of Bolivia and Peru. The hunt for these ultra-distance human smugglers, and the prospective terrorist travelers they can transport, has been part of a virtually forgotten or unknown counterterrorism-immigration control strategy that has unfolded far from the public controversies about physical land borders. Its objective has been to disable the smuggling networks in foreign lands and thus reduce the volume of their higher-risk migrant clients and discern any terrorist travelers camouflaged among them. Finally, and as a last resort, the strategy hoped to net those getting through the foreign dragnet at the home border. The idea was always that if economic opportunists or war refugees could be transported from countries of interest to the U.S. land border, then certainly so too could terrorists living in those states; they had to be caught en route or deterred. But as it turns out, the American effort hasn’t been going well, according to various government reporting and other information.6 While it is true that no SIA is publicly known to have mounted a homeland attack plot to date in the United States, the public record demonstrates that these ultra-marathoners of human smuggling have continued ferrying SIAs, including Syrians, to the Texas, California, Arizona and New Mexico borders with annual regularity since 9/11—and that the prospect for terrorist travelers to be among them remains.7 The routes generally follow South America-Central America-Mexico pathways with a United States terminus. Most importantly, these networks have, on occasion, transported individuals with suspected involvement in Islamic terrorist organizations. The purpose of this essay is to provide detailed knowledge about how the smuggling occurs and a strategic blueprint for how to approach it the day when American homeland security leaders are called upon to reduce the threat of terrorist border infiltration in the way their European counterparts now have. It is based on a deconstructive study of 19 U.S. prosecutions of SIA smuggling networks between September 2001 and September 2015, the total known cases. Incorporated into the study, which used NVivo qualitative analysis software, were thousands of pages of court records and non-court narrative data, such as the public testimony of U.S. security leaders, official government reports, and credible media information. The formal SIA interdiction priority is traceable to a November 2004 memorandum from U.S. Border Patrol Chief David Aguilar to all field agents.16 It listed 35 countries of interest and instructed border agents to take eight listed actions when migratory citizens of the countries were apprehended (see Figure 1). The first step required a “Significant Incident Report” be filed to the CBP Situation Room within an hour of any SIA apprehension. Afterward, all SIAs over the age of 14 would be put through national security database checks and their pocket contents seized for analysis. Perhaps the most potent indication that enforcement strategy lags the trend is that SIAs have reached the U.S. southwestern border in steady annual numbers since the start of the post-9/11 American law enforcement effort.27 Government data reflecting SIA apprehensions, episodically obtained by media outlets, show they consistently reached the southwestern border each year since 9/11, with unknown numbers undoubtedly slipping through undetected. For example, one set of SIA apprehension data reflecting September 2001 through 2007 showed that nearly 6,000 SIAs from 40 countries had reached the southwest border.28 Other SIA apprehension data made public since 2007 suggest the traffic has continued at a regular pace.29 A 2009 GAO audit of border patrol highway checkpoints 25 miles inland from the Rio Grande found more than 530 SIAs logged in 2008 alone, including three “identified as linked to terrorism.”30 A Texas Department of Public Safety intelligence report leaked in 2015, citing U.S. Customs and Border Protection (CBP) data, asserted that there were more than 493 encounters with SIAs in Texas during the first nine months of 2014, a 15 percent increase over the same time the previous year.31 The 19 cases collected for the study suggest—though do not confirm—a relative paucity of such investigations by the assigned U.S. agencies. To be fair, U.S. officials do note in various public forums that transcontinental SIA investigations are highly complex and difficult because they cross so many international jurisdictions, require reliable bilateral cooperation, operate covertly, and are expensive. The tenacity of SIA smuggling occurs in a void of academic literature about all human smuggling, particularly the only form considered a terrorism-related homeland security threat. This dearth of knowledge is problematic because strategy and tactics are best served by comprehension. In 2011, for instance, the United Nations Office on Drugs and Crime (UNODC) released a survey of available literature on global human smuggling and “irregular migration.”32 The survey found it problematic that so little research had been done to understand such a consequential phenomenon.33 Among the literature survey’s findings of scholarly neglect, for instance, was that research had suffered from unreliable data, unbalanced geographical coverage, use of theoretical frameworks not globally applicable, disparities in the quality and quantity of information about how networks are organized, and perspectives over-representing destination countries at the expense of transit or origination countries.34 This survey failed to mention the potential for terrorist travelers. Understanding how SIA networks function from a systematic break down of the 19 known federal court prosecutions of them, and showing them as complex interdependent systems, would seem a fundamental first step to improving enforcement outcomes against them. Yet American efforts to date have gone scarcely known, and therefore not publicly questioned, evaluated or professionally audited and validated as would be expected of most legislated government strategies. SIA smuggling is not one-stop shopping. Like any other industry, fees and services cater up or scale down depending on clients’ ability to pay. Those wishing to reach the United States may choose services that range from all-inclusive, doorstep-to-doorstep guided journeys, to more piecemeal arrangements that cost less. Ultra-distance SIA smuggling organizations are primarily based in foreign countries and depend on loose, but highly effective transnational alliances. As ICE Executive Associate Director James A. Dinkins testified to Congress in 2010, these multi-component alliances involve various operators, such as recruiters, brokers, document providers, transporters and corrupt foreign officials, to exploit vulnerabilities in the immigration and border controls of many nations.35 Organizationally, 12 of the 19 studied networks were full-service, stage-to-stage smuggling systems that featured a pyramid-like architecture. To understand which methods SIA smugglers choose to move their human cargoes, and why, it is first necessary to understand the where. 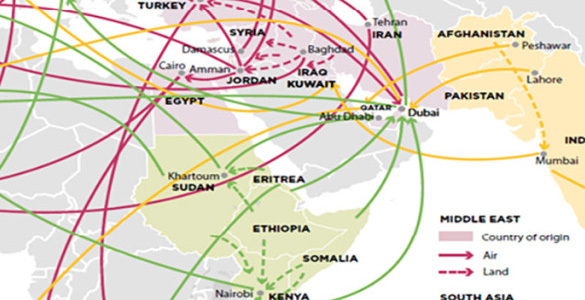 It turns out that smugglers have quite logical reasons, to be described, for why they transported their U.S.-bound migrant clients from their home countries in the Middle East, North Africa and South Asia along certain air, land, and sea paths. While initial routings were somewhat unique to each of the three regions, eventually all converged in the Americas along common northward passageways. SIAs from the Middle East often moved through Turkey and Greece to the Gulf states of UAE and Qatar, but also European countries such as France, Spain, Italy, and Germany—and sometimes, through Russia. Major air hubs in these countries then linked them to the Americas: Cuba, Ecuador, Peru, Colombia, Guatemala, and Mexico. From North African countries such as Somalia, routes often ran from Ethiopia, Kenya, and Sudan through the Gulf States, South Africa, and occasionally Europe. From South Asian countries such as Pakistan and Afghanistan, migration entailed among the highest fees because distances to Latin America were greatest and thus SIAs travelling on these routes faced the highest risk of law enforcement interceptions along the way. 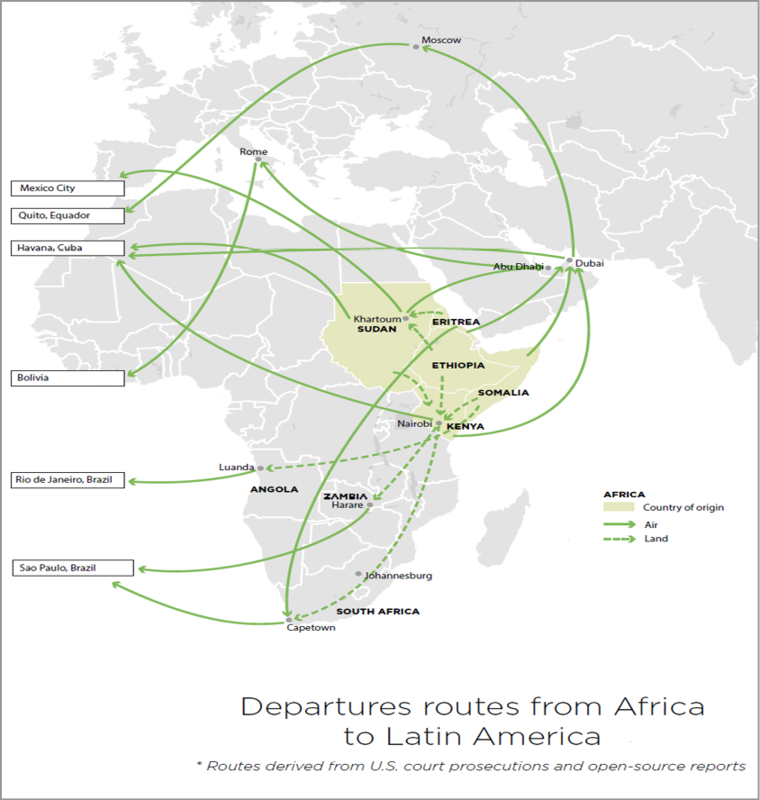 Routes most often transited through South Africa, the Gulf States and Europe. Once SIAs reached the Western Hemisphere, some nations were frequently used either for “staging,” or “transit.” A distinction should be made between them. In staging countries, migrants linger for days, weeks, or sometimes months, awaiting coordination for the next travel phase in smuggler-controlled safe houses or hotels. Migrants in transit countries were, by contrast, on the move, stopping only for sleep or rest. Some staging countries doubled as transit countries, most notably Mexico and Guatemala. Twelve of the 19 smuggling organizations used either Brazil (5) or Ecuador (7) for landing and staging SIAs. Other commonly used landing and staging countries included Cuba, Mexico, and Guatemala. Guatemala and Panama figured prominently in almost all of the examined data about SIA smuggling because they act as funneling land bridges that must be crossed. In all countries, north was the direction of migration. 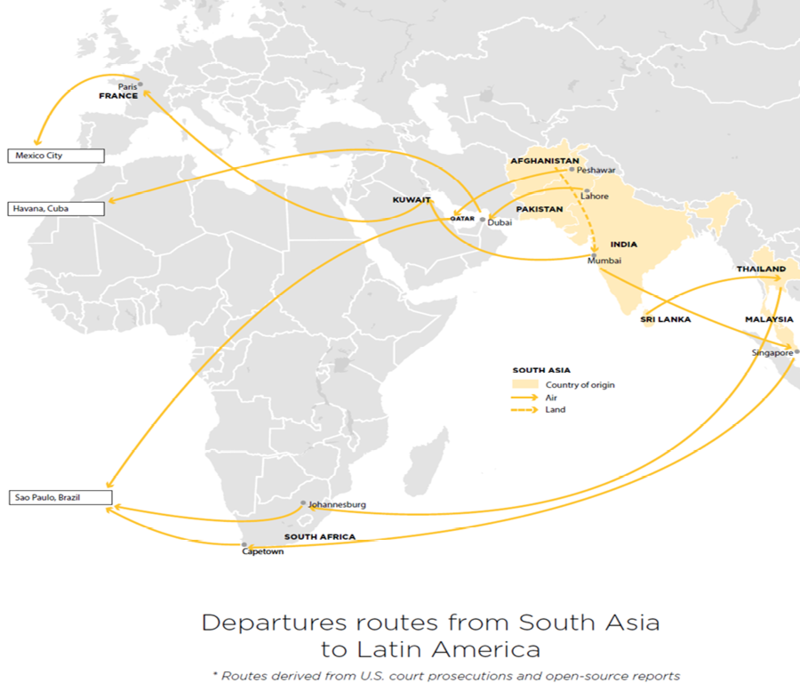 Route choice, it turns out, appears to be deeply embedded in the ability of SIA smugglers to discern and leverage country-specific circumstances and opportunities. Sometimes, one or two critical enabling factors in each country or region determined their success. Knowing what some of these critical enabling factors are can inform law enforcement intervention and intelligence collection activity. While this research does not identify every probable critical enabling factor, a number did emerge in the data. These are identified as fail points, which American border security strategists should consider addressing. Following descriptions of these fail points, strategies for best exploiting them are suggested. Additionally, SIA smugglers often maintained pivotal access to key corrupt officials or to fraudulent document supplies. Most of the smugglers appeared to make significant use of their knowledge of other languages, particularly Spanish and English. Mobility and multilingualism enabled these SIA smuggling kingpins to legally enter and exit staging and transit nations at will, and to manage clients and indigenous partners along the way. Prosecutors summed up this specialization when they described the versatility of Eritrean national smuggler Halbtom Merhay this way: “the defendant is believed to be a citizen of Great Britain, to reside in the United Arab Emirates, and to travel frequently to London, England” and therefore “has contacts with fraudulent document vendors, human smugglers, and travel agents in numerous countries.”37 American and British passports, given their acceptability in the widest range of nations, proved to be of particular value for Merhay and others of the prosecuted smugglers. For example, the Syrian SIA smuggler Nizan Lorian held U.S. citizenship but maintained residences in Guatemala and Mexico, enjoying ease of travel throughout Latin America and the United States on his American passport. Investigators noticed that the American passport of naturalized U.S. citizen Neeran Zaia, who was also a citizen of Jordan and spoke Arabic, Spanish, and English, showed extensive travel to the Middle East and throughout South America. These attributes, though, present a key organizational vulnerability too; they likely render SIA smuggling kingpins less dispensable than those who run other kinds of smuggling enterprises because their capabilities are so highly specialized and necessary, suggesting relatively low organizational resiliency which can be targeted. Information from the collected data could not sufficiently determine the ease with which arrested SIA smuggling kingpins were replaced and their disrupted operations restored, a subject worthy of additional study. But some limited reporting suggests that restoration may be slower than in other kinds of illicit black market enterprises. A U.S. immigration officer testified in a Mexican court affidavit that after the Mexico-based Lebanese smuggler Salim Boughader-Musharaffille was arrested in 2003 for transporting hundreds of Lebanese SIAs into California, at least several months passed before some of the traffic resumed.38 Left unclear in the reporting is whether or not the new organization was able to move migrants by the hundreds as did Boughader-Musharaffille. Other case records revealed that underlings do lie in wait for kingpins to be removed or to step aside, although timelines were not available to indicate delay times. For instance, the 1997 arrest of a “legendary” Ecuador-based alien smuggler named George Tajirian, responsible for smuggling hundreds of Middle Easterners into the United States during the 1990s, was followed by a competition for the helm among numerous successors.39 The prolific Iranian smuggler Mohammed Hussein Assadi won out and ran a highly lucrative network until his own 2002 arrest. The foreign diplomatic missions of some Latin American transit countries—inside the originating countries of interest—figured often in extreme-distance SIA smuggling. These outposts provided crucial travel documents that could put migrants within closer striking distance of the American border. SIA smugglers incorporated into their business models the acquisition of travel visas and passports from Mexico’s consulate offices in Lebanon, Turkey, and India; Belize’s diplomatic mission in Singapore; Guatemala’s consulate in Jordan; and Cuba’s embassies in Syria and Kenya. The reason for this has a logical basis; such visas or passports can land migrants closer to the U.S. border, reducing distance, cost and risk. SIA travelers still in their home countries prefer to first reach Mexico directly, given its U.S. border access, then in descending order of preference, nations to Mexico’s south. Therefore, Mexico’s foreign missions were among the most valuable and problematic. Court cases and public data showed that Mexico’s embassies have figured in SIA smuggling in Cuba, Turkey, India, Jordan, Colombia, Lebanon, and Belize, where visas or blank passports were fraudulently sold for thousands of dollars each. The 2005 smuggling prosecution of Iranian smuggler Zeayadali Malhamdary showed that fraudulent use of Mexican visas and passports continued after the Beirut investigation. Malhamdary predicated his entire operation on acquiring Mexican visas, for which he would charge $12,000 each, boasting to one undercover agent that he had used them to smuggle 60 Iranians over the Arizona border.43 Malhamdary would meet his prospective Iranian clients in Tehran or European cities and collect their passports. A third party would obtain the Mexican visas (the method is not revealed) without the applicants’ required physical presence, returning them to their owners for travel. Despite such efforts to enforce integrity following 9/11, Mexican consulate offices remained vulnerable. In March 2008, for example, three Afghans were discovered at the Kuwait airport posing as Mexican citizens en route “home” to Mexico.47 The Afghans were detained during a layover when a Kuwaiti customs officer asked them to speak Spanish and two of the three could not. Each carried an authentic, bar-coded passport with Mexican pseudonyms.48 Investigation showed the Afghans paid $10,000 each for the passports from the Mexican consulate office in Mumbai, India. Sometimes corruption played a definitive role in the document provision, but so too, may fraudulent applicant behavior intended to outwit visa application personnel. A typical example emerged from an FBI informant placed inside a Texas detention facility and who asked for a smuggler to get his brother out of Somalia. The Brazil-based Somali smuggler Ahmad Dhakane, who had just been apprehended crossing the border from Mexico, told the informant that he could do it by obtaining six-month Brazil missionary visas through a Nairobi church and 90-day Mexican visas for $9,000.52 As a bonus, Dhakane let the informant know that missionary visas also enabled his clients to obtain free traveler’s health insurance. The enabling power of Latin America’s visas, through diplomatic missions abroad, also is exemplified by the experience of 24-year-old Iraqi war refugee Ahmr Bahnan Boles, who fled with hundreds of thousands of other Iraqis in the mid-2000s to neighboring Syria and Jordan.53 In Damascus, Syria, a limited service smuggler offered, for $700, to obtain a visa from Guatemala’s consulate station in downtown Amman, Jordan. Boles himself did not personally appear, as is required.54 With the visa inside Boles’ Iraqi passport, he paid $70 for a transit visa at the local Cuban embassy in Damascus. With an airline ticket from Damascus through Moscow, the visas enabled Boles to reach Cuba, then Guatemala City and finally Texas. Countries diplomatically estranged from the United States offered the critically enabling advantage to SIA smugglers of relative imperviousness to U.S. demands for action or bilateral cooperation. Cuba, Venezuela, Russia, Bolivia, and, to a certain extent, Ecuador, figured often in SIA smuggling as transit and staging countries. The willingness of Cuba and Moscow to allow unquestioned passage to Boles, with little regard for U.S. sensitivities, underscores a more expansive role that such estranged nations have played in the years since 9/11. For instance, Venezuela, which has been at diplomatic odds with the United States since Hugo Chavez came to power in 1999, was an SIA transit country in several of the examined court prosecutions. The U.S. Department of State’s 2014 Country Reports on Terrorism noted that Venezuela had not cooperated fully with U.S. counterterrorism efforts for nine consecutive years.56 In 2007, long lines of local citizens in the Venezuelan embassy in Damascus, Syria, waited for nine different kinds of tourist and business visas described as easy and affordable to receive.57 Bolivia, which had cut most ties to the United States in 2008 when a leftist government took power, has figured as an SIA staging and transit country. In addition to cold diplomatic relations limiting or precluding responsiveness to U.S. security concerns, sometimes corruption played a definitive role in the document provision, as did fraudulent applicant behavior to outwit visa application personnel. The probable prevalence of asylum fraud among country of interest SIAs, as well as clear indications that the American system is highly vulnerable to it, represents a leverage point opportunity for improved law enforcement asylum fraud detection and supporting intelligence collection. For SIA smuggling through Latin America, hotels and boarding houses used to stage SIAs seemed to fit Staring’s findings. They became central social exchanges where ethnic and religious compatriots conspired to breach the American border, such as a hotel that Somali smuggler Muhammad Dhakane maintained in Sao Paulo, Brazil or a Holiday Inn in Quito, Ecuador used often by the Syrian smuggler Nizar Lorian. From his base in Tijuana, Mexico, home to thousands of Lebanese immigrants and their descendants, the Lebanese smuggler Salim Boughader-Musharafille was not an itinerant smuggler; he was a well-known restaurateur with deep roots in Tijuana. Boughader-Musharaffille owned the popular La Lebanesa Café. An underground, transcontinental information grapevine was centered at the cafe, drawing those already en route or those wishing to be smuggled over the California border to make arrangements. Mexico, Panama, and other countries of Latin America sheltered, fed and then provided temporary legal status to released, apprehended SIAs, rather than deporting them to home countries. This practice enabled migrants to easily continue their northward journeys for the same reasons they need U.S. asylum: early deportation would result in the loss of once-in-a-lifetime fortunes in smuggling fees not easily raised for follow-up attempts. Catch, rest, and release policies, especially in geographically necessary Mexico and Panama, mitigated any potential deterrent consequence. 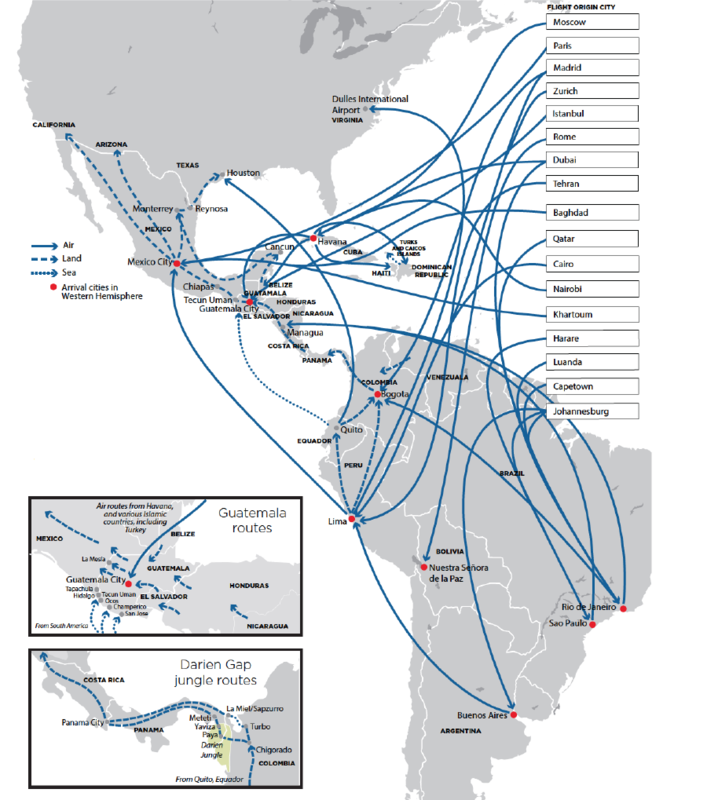 For good reason, it turns out, SIA networks have purposefully routed their clients through the same six transit or staging countries in Latin America on the northward march to the U.S. southwestern border: Ecuador, Brazil, Colombia, Panama, Guatemala, and Mexico. Beyond catch, rest, and release, these six nations all feature several distinct enabling geopolitical factors, which proved critical to the forward progress. These are: politically passive governments indifferent to trans-migration and U.S. security concerns, weak government institutions and budgets that preclude direct action, formal policies that unintentionally assisted the smugglers (such as catch, rest, and release), and the corruptibility of border and airport customs officials. Colombia’s institutional weaknesses and disinclination to patrol and deport have already been detailed. But also highly emblematic of all of these critical enabling factors is Guatemala, which has been described as a super-highway of virtually unimpeded human smuggling to Mexico.82 The human smuggling industry has become so politically and economically powerful that at times it has completely co-opted government control over border and customs police. Border control on Guatemala’s south and north border is largely nonexistent. 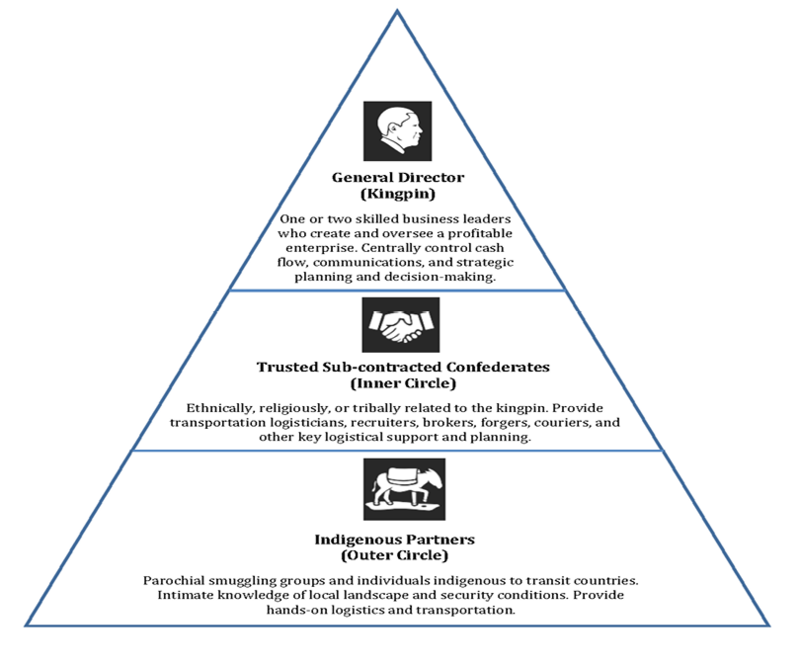 Although less is known about what happens outside of the six identified countries of Latin America, anecdotal evidence indicates the same critically enabling factors of corruption, official indifference, and formal policy also draw SIA smugglers to the Gulf States for staging and transit to Latin America. And, South Africa emerged in the study as a key air hub transit point for SIAs bound for Latin America. The strategy recommendations offered in this section constitute a mix of expanded conventional law enforcement and intelligence operations abroad. Carrying them out would require a robust foreign security assistance and development aid program, backed by a willful, muscular diplomatic initiative, targeting at least the six Latin American countries used most frequently by SIA smugglers. End catch, rest, and release policies in Panama and Mexico and fund the establishment of deportation processes and capabilities such as repatriation flights that would remove SIAs to their home countries. Fund the creation or expansion of corruption-vetted, mobile customs and border patrol units substantially dedicated to seeking out SIAs in currently unpatrolled bottleneck regions. Increase the number of American counter-smuggling investigators from conventional law enforcement agencies, especially ICE agents deployed to attaché offices in the key transit countries. The agents would target exclusively SIA kingpin smugglers and their potential successors. Policy leaders should ensure that SIA smuggling investigators are not diverted to drug trafficking cases, as past GAO reporting has noted. This strategy targets kingpin smugglers in recognition that their specialized capabilities and skills are not easily or quickly replaced. U.S. investigators would identify and track smuggling hierarchies in their regions of operations and share information with investigators in other regions. The U.S. should pressure the governments of Ecuador, Brazil, and Guatemala to recruit informants and conduct surveillance targeting expatriate communities, hotel complexes, and cultural locations around which SIA smuggling is facilitated. At the same time, the U.S. should deploy American intelligence officers to collect information inside the same ethno-national enclaves. Expatriate immigrant communities in Latin American cities, as well as local hotels in proximity to them, are known for staging. As such, they are rich, untapped potential sources of intelligence on local smuggling, as well as on traveling and indigenous violent extremists, corrupt border guards, and airport officials. Invest in retraining and increasing staff in the U.S. Citizen and Immigration Service (USCIS) Asylum Officer Corps so that its agents can be better equipped to extract intelligence information and leads from SIA asylum seekers who reach the U.S. border, as well as to help detect asylum fraud. This initiative acknowledges that USCIS officers have been left ill-equipped to detect large-scale asylum fraud. It also acknowledges that the USCIS asylum officer cadre has unique access to a category of asylum seekers that has proven to be a highly rich source of intelligence information about smuggling facilitators, routes, and modus operandi: SIAs who have been detained. USCIS officers should capture intelligence information that otherwise may never be collected while also more strenuously rooting out those defrauding asylum vetting processes. Use state and local law enforcement agencies associated with fusion centers in U.S. states that border Mexico to interview apprehended SIAs in their jurisdictions, and provide the resulting reports to federal partners for analysis and use in international investigations. Since 9/11, local policing authorities have been designated as partners in many counterterrorism efforts, often through fusion centers where agencies are purposefully housed together to enhance better sharing and collaboration. Such law enforcement officers are often vetted, trained, and have federal security clearances. When federal agents are unable to interview all detained SIAs, local law enforcement resources should extend coverage on grounds that SIA have so often proven to be among the most prolific sources of actionable intelligence about their smugglers. Ensure that the governments of Mexico, Guatemala, Belize, Ecuador, (and Cuba, once full diplomatic relations are restored) more robustly monitor, vet, audit, and investigate for corrupt practices within foreign service staffs stationed in consulate offices and embassies in countries of interest. At the same time, unilaterally deploy American intelligence officers to collect information about potentially corrupt foreign consulate offices. This strategy would confront an important leverage point: corrupt or inadequate visa and passport issuance from the consulates of key Latin American transit countries, which eases SIA travel. This strategy would introduce integrity operations by home countries, reinforced and aided by covert American intelligence collection that could be leveraged in various ways. Establish an expectation that local governments turn their intelligence collection activity toward terrorist travelers and SIA smuggling kingpins, as well as Islamic extremists and criminals residing in ethno-national expatriate enclaves. Expect that they alert American investigators about all SIA detentions and grant access to any detainee for intelligence collection purposes. This strategy seeks to support pursuit of kingpin smugglers, potential successors, and SIA facilitators that American law enforcement can investigate and arrest. Cultivating apprehended migrants as sources of information about kingpins would exploit the finding that SIA migrants have been among the most prolific information sources and have frequently been willing to work with investigators and prosecutors. Deploy CIA officers to diplomatically estranged and hostile SIA transit countries, or repurpose those already stationed to develop human source networks capable of reporting about SIA smuggling and terrorist travelers. This strategy speaks to an intervention chokepoint where smugglers take advantage of absent U.S. law enforcement inside diplomatically hostile or uncooperative states. SIA travel has often depended on such relations to enjoy relatively free operational reign in Russia, Cuba, Venezuela, Ecuador, and Bolivia. Nicholas Winton was the British subject credited with saving 669 Jewish children from the Holocaust by forging their travel documents and transporting them out of Nazi-occupied Czechoslovakia over nine months in 1939.98 Winton had resorted to theft, bribery, blackmail, and forging their exit visas to mask the origin of the children because foreign governments, including the United States, had refused to provide timely asylum or legal entry to the children.99 Winton was never prosecuted for human smuggling or asylum fraud as would be urged for such smugglers here; rather, in 2002, Queen Elizabeth knighted him for his deeds, and he has since been lionized as a humanitarian hero in films and books. The Winton case should serve as a reminder to current American homeland security leaders that any initiative to bring SIA smugglers to justice and deport and deter their clientele should be balanced by a conscientious program to discern the true identities and motives of all those encountered along the routes, in humanitarian consideration that non-terrorists may well authentically need sanctuary, as did Winton’s 669 children. Taking this care would be in line with other core U.S. values, many explicitly embodied in asylum law requiring sanctuary for those persecuted on social, political, or religious grounds. Todd Bensman manages a team of intelligence analysts and planners dedicated to the identification, study and reporting of terrorism threats for the Texas Department of Public Safety’s Intelligence and Counterterrorism Division. He transitioned to this role in 2009 after a 23-year career as a newspaper, television and magazine journalist focused on Islamic extremism, border security and Mexico’s drug war. He has worked in 25 foreign countries, and is the recipient of two National Press Club awards for foreign reporting among many others for his domestic investigative reporting work. He has worked for The Dallas Morning News, CBS News, and Hearst Newspapers covering federal law enforcement and national security. Bensman earned a master’s degree in Homeland Security Studies, with distinction (Outstanding Thesis), in September 2015 from the U.S. Naval Postgraduate School. He also holds a master’s degree from the University of Missouri School of Journalism and a bachelors’ degree in Journalism from Northern Arizona University. In 2012, NAU presented him with its AP Robert R. Eunson Distinguished Alumni Achievement Award in Journalism. He has taught journalism as an adjunct instructor for Texas State University. He can be reached at todd.bensman@gmail.com. Any opinions expressed in this essay are solely the author’s. 1 “Travels of President George W. Bush,” U.S Department of State Office of the Historian, accessed July 22, 2015, https://history.state.gov/departmenthistory/travels/president/bush-george-w .
2 George W. Bush, Decision Points (New York: Crown Publishing Group, 2011), 302. 4 Stacy Meichtry and Joshua Robinson,“Paris Attacks Plot Hatched in Plain Sight,” The Wall Street Journal, November 24, 2015, http://www.wsj.com/articles/paris-attacks-plot-was-hatched-in-plain-sight-1448587309; David Gauthiar-Villars, “Paris Attacks Show Cracks in France’s Counterterrorism Effort,” The Wall Street Journal, November 23, 2015, http://www.wsj.com/articles/paris-attacks-show-cracks-in-frances-counterterrorism-effort-1448244796; Marcus Walker and Noemi Bisserbe, “Paris Stadium Attacker Entered Europe Via Greece,” The Wall Street Journal, November 16, 2015, http://www.wsj.com/articles/paris-stadium-attacker-entered-europe-via-greece-1447698583 . 5 Sean Everton, Disrupting Dark Networks (Cambridge: Cambridge University Press, 2012), xxv. 6 General Accountability Office, Border Patrol: Key Elements of New Strategic Plan Not Yet in Place to Inform Security Status and Resource Needs, (GAO-13-25) (Washington, DC: Government Accountability Office, 2012), 20–23. 7 Judicial Watch Press Room, “Judicial Watch Obtains New Border Patrol Apprehension Statistics for Illegal Alien Smugglers and ‘Special Interest Aliens,” Judicial Watch, March 9, 2011, www.judicialwatch.org; Edwin Mora, “474 Illegal Aliens from Terrorism Linked Countries Apprehended in 2013 Alone.” BreitbartTexas.Com, 2014, http://www.breitbart.com/national-security/2014/09/19/474-aliens-from-terrorism-linked-countries-apprehended-in-2014-alone/; Todd Bensman, “Breaching America: War Refugees or Terror Threat?” San Antonio Express News, May 20, 2007; Todd Bensman, “Have Terrorists Crossed? Border Security Critics Assert No Terrorist Has Ever Illegally Jumped U.S. Borders; They Would Be Wrong,” The Investigative Project on Terrorism, March 28, 2008, http://www.investigativeproject.org/625/have-terrorists-crossed#; Ryan Lovelace, “Mexican Cartels Caused the Border Crisis: And the Obama Administration Falsely Took Credit for Stopping it,” National Review, March 6, 2015, www.nationalreview.com . 8 Blas Nuñez-Neto, Alison Siskin, and Stephen Yina, Border Security; Apprehensions of “Other than Mexican” Aliens (CRS Report No. RL33097), Washington, D.C.: Congressional Research Service, 2005, http://trac.syr.edu/immigration/library/P1.pdf, 19. 9 Homeland Security Act of 2002, Pub. L. No. 107–296, Title IV, Subtitle A, Sec. 401 (2001). 10 The White House, National Strategy for Preventing Terrorism (Washington, DC: The White House, 2006), http://georgewbush-whitehouse.archives.gov/nsc/nsct/2006/. 11 Intelligence Reform and Terrorism Prevention Act of 2004, Pub. L. 108–458, Sec. 7201, b1, http://www.state.gov/m/ds/hstcenter/. 12 Human Smuggling and Trafficking Center, Establishment of the Human Smuggling and Trafficking Center: A Report to Congress (Washington, DC: U.S. Department of Homeland Security, 2005), http://www.state.gov/documents/organization/49600.pdf. 13 Secure Fence Act of 2006, H.R. Rep. No. 6061, Sec. 2(b) (2002), http://www.gpo.gov/fdsys/pkg/BILLS-109hr6061enr/pdf/BILLS-109hr6061enr.pdf. 14 “Enacted Border Patrol Program Budget by Fiscal Year: 1990–2014,” U.S. Border Patrol, accessed July 22, 2015, http://www.cbp.gov/sites/default/files/documents/BP%20Budget%20History%201990-2014_0.pdf. 17 Penny Star, “Napolitano: DHS Is Working with Mexico on ‘Special Interest Aliens’ Threat along the U.S.-Mexico Border.” CNS News, January 17, 2012, http://cnsnews.com/. 18 Todd Bensman, “Breaching America: War Refugees or Terror Threat?” San Antonio Express News, May 20, 2007. 19 Government Accountability Office, Border Patrol: Key Elements of New Strategic Plan Not Yet in Place to Inform Security Status and Resource Needs (GAO-13-25) (Washington, DC: Government Accountability Office, 2012). 21 Testimony of U.S. Immigration and Customs Enforcement Homeland Security Investigations Executive Associate Director James Dinkins for the U.S. House of Representatives Committee on Homeland Security Subcommittee on Border, Maritime and Global Counterterrorism, 22 July 2010. 24 Richard M. Stana, Alien Smuggling: DHS could Better Address Alien Smuggling along the Southwest Border by Leveraging Investigative Resources and Measuring Program Performance (GAO-10-919T) (Washington, DC: Government Accountability Office, 2010), http://www.gao.gov/new.items/d10919t.pdf. 25 General Accountability Office, Border Patrol:Key Elements of New Strategic Plan Not Yet in Place to Inform Security Status and Resource Needs (GAO-13-25) (Washington, DC: Government Accountability Office, 2012), 20–23. 27 Todd Bensman, “Breaching America: War Refugees or Terror Threat?” San Antonio Express News, May 20, 2007. 29 Judicial Watch Press Room, “Judicial Watch Obtains New Border Patrol Apprehension Statistics for Illegal Alien Smugglers and ‘Special Interest Aliens,” Judicial Watch, March 9, 2011, www.judicialwatch.org; Edwin Mora, “474 Illegal Aliens from Terrorism Linked Countries Apprehended in 2013 Alone,” BreitbartTexas.Com, 2014, http://headlinedigest.com/2014/09/illegal-immigrants-from-terrorism-linked-countries-flooding-across-u-s-border/. 30 Government Accountability Office, Border Patrol:Checkpoints Contribute to Border Patrol’s Mission, But More Consistent Data Collection and Performance Measurement Could Improve Effectiveness, 27, GAO-09-824. 31 Ryan Lovelace, “Mexican Cartels Caused the Border Crisis: and the Obama Administration Falsely Took Credit for Stopping it,” National Review, March 6, 2015, www.nationalreview.com. 32 Daphné Bouteillet-Paquet, Smuggling of Migrants: A Global Review and Annotated Bibliography of Recent Publications (New York: United Nations, 2011). 35 U.S. Immigration and Customs Enforcement, Department of Homeland Security: Regarding a Hearing on Enhancing DHS’ Efforts to Disrupt Alien Smuggling across Our Borders (2010) (statement of James A. Dinkins, ICE Executive Associate Director of Homeland Security Investigations), 3, http://www.ice.gov/doclib/news/library/speeches/100722dinkins.pdf. 36 Abdallah (Egypt/Guatemala), Arbane (Syria/United States/Ecuador), Assadi (Iran/Ecuador), Boteng and Ibrahim (Ghana/Belize/Mexico), Boughader-Musharafille (Lebanon/Mexico), Dhakane (Somalia/Brazil/Guatemala), Fessahazion (Eritrea/Guatemala), Gauchan (Nepal/Guatemala/Mexico/Japan/Asia/Europe), Gerald (Trinidad and Tobago/Guayana), Lala (Pakistan/Canada) Jarad(Jordan/Ecuardo), Lorian(Syria/United States/Mexico/Guatemala), Malhamdary (United States), Merhay (Eritrea/Great Britain/ United Arab Emirates), Thakker(India/Dominican Republic/Mexico/Guatemala), Tacy(United States/Kenya), Ul Haq (Pakistan/Ecuador), and Zaia (Jordan/United States). 37 United States v. Merhay, Government Motion for an Order to Seal, Document 2. 38 Pauline Arrillaga and Olga Rodriguez, “Investigation: Smuggler Pipelines Channel Illegal Immigrants into the U.S.” The Associated Press, July 3, 2005. 39 United States v. Assadi, Government Motion for Upward Departure. 40 Pauline Arrillaga and Olga Rodriguez, “Investigation: Smuggler Pipelines Channel Illegal Immigrants into the U.S.” The Associated Press, July 3, 2005. 41 Tom Diaz and Barbara Newman, Lightning out of Lebanon: Hezbollah Terrorists on American Soil (New York: Random House, 2006), 221. 43 United States v. Zeayadale Malhamdary, 9th Cir. Ct. (D. Ariz., 2005), Second Superseding Indictment, Document 42. 44 Todd Bensman, “Breaching America: War Refugees or Threats?” Hearst Newspapers, May 1, 2007. 47 Guillermo Contreras and Todd Bensman, “Three Afghans Arrested with Fake Mexican Passports,” San Antonio Express News, March 24, 2008, http://ibloga.blogspot.com/2008/03/afghan-nationals-caught-with-genuine.html. 49 Todd Bensman, “Iraqi Border Jumpers,” Global Post, May 30, 2010. 51 United States v. Annitta Devi Gerald, 5th Cir. Ct. (S.D. Tex., 2009), Criminal Complaint. 52 United States v. Ahmad Dhakane, FBI Verbatim Translation, Document 68–69. 53 Todd Bensman, “War Refugees or Threats?” San Antonio Express-News, May 20, 2007. 56 U.S. Department of State, Country Reports on Terrorism 2013: Western Hemisphere, (Washington, DC: U.S. Department of State), http://www.state.gov/j/ct/rls/crt/2013/224825.htm. 58 Todd Bensman, “Attorneys Speak out on Mexican Deportations,” Global Post, May 30, 2010, http://www.globalpost.com. 59 United States v. Rakhi Gauchan, Complaint, Document 3. 61 Government Accountability Office, U.S. Asylum System: Agencies Have Taken Actions to Help Ensure Quality in the Asylum Adjudication Process, but Challenges Remain, (GAO-08-935) (Washington, DC: Government Accountability Office, 2008), http://www.gao.gov/assets/290/281583.html. 62 Cheryl K. Chumley, “Four GOP Reps Press for GAO Probe of ‘Rampant’ Asylum Fraud,” Newsmax, February 25, 2014, http://www.newsmax.com/. 63 Government Accountability Office, Additional Actions Needed to Address Fraud Risks, (GAO-16-50) (Washington, DC: Government Accountability Office, 2015, http://www.gao.gov/assets/680/673941.pdf . 64 Ruth Ellen Wassem, Asylum and “Credible Fear” Issues in U.S. Immigration Policy (CSR Report No. R41753) (Washington, DC: Congressional Research Service, 2011). 66 United States v. Fidse and Sheikh, Defendant’s Motion to Dismiss for Due Process Violation; Unsealed Indictment, Document 3. 67 United States v. Fidse and Sheikh, Detention Order, Document 26. 71 United States v. Ibrahim and Boateng, Case Memo in Support of Sentencing Recommendation. 72 United States v. Ibrahim and Boateng, Case Memo in Support of Sentencing Recommendation. 76 U.S. Department of State, Country Reports on Terrorism 2014. 80 Todd Bensman, “Stuck in the Middle,” San Antonio Express-News, May 22, 2007. 81 United States v. Ibrahim and Boateng, Transcript from Sentencing Hearing. 89 United States v. Fessahazion, Indictment, Document 1. 90 Richard Pollack, “Guatemala’s Human Smuggling Network Is Big Business for Coyotes,” Washington Examiner, August 21, 2014, http://www.washingtonexaminer.com. 91 Luisa Feline Freier, Open Doors (for Almost All): Visa Policies and Ethnic Selectivity in Ecuador, (London: London School of Economics, Center for Comparative Immigration Studies, 2013). 96 Slobodan Djajić and Michael S. Michael, “Controlling Illegal Immigration: On the Scope for Cooperation with a Transit Country,” European Trade Study Group, July 2013, http://www.etsg.org/ETSG2013/Papers/244.pdf. 98 Robert D. McFadden, “Nicholas Winton, Rescuer of 669 Children From Holocaust, Dies at 106,” The New York Times, July 1, 2015, http://www.nytimes.com/2015/07/02/world/europe/nicholas-winton-is-dead-at-106-saved-children-from-the-holocaust.html. 99 Lydia Warren, “The Astonishing Story of How a Humble London Stockbroker Saved 669 Children – Most of Them Jews – from Czechoslovakia on the Eve of World War II,” The Daily Mail, http://www.dailymail.co.uk/news/article-2615101/The-astonishing-story-humble-London-stockbroker-saved-669-children-Jews-Czechoslovakia-eve-World-War-II.html. 100 “Travels of President George W. Bush,” U.S. Department of State Office of the Historian, accessed July 22, 2015, https://history.state.gov/departmenthistory/travels/president/bush-george-w.
101 “Travels of President George W. Bush,” U.S. Department of State Office of the Historian, accessed July 22, 2015, https://history.state.gov/departmenthistory/travels/president/bush-george-w. Extremely well done article that articulates this national security threat like only Todd Bennsman could do. Todd is and has been the premier expert on the exploitation of the US/Mexican border by smuggling groups associated with global jihad. Every Congressman and woman should read this report. A riveting piece that leaves one lost for words at how the authorities of the world’s greatest nation have become so nonchalant about securing its borders and protecting its citizens.